Whether you’re a wine connoisseur or a cocktail enthusiast (or Homer Simpson), a trip to the liquor store is something we as Delhiwallahs are all too familiar with. Going to buy a particular brand of wine and having to come back with something completely different is also something we’re too familiar with. So, we’ve compiled a list of thekas that are always stocked to the brim and never disappoint. Who expected a beautifully-stocked wine shop in the middle of the computer market? Just behind Satyam Cinemas, this place has an impressive selection of whisky, including Japanese specials such as Yamazaki. This spacious liquor shop bang in the middle of Select Citywalk mall is a paradise for the wine connoisseur. Taken over by Brindco not too long ago, the focus here is entirely on the vino, so you might want to pay it a visit before a big date. They’re also the only peeps in town who stock Diddy’s vodka. 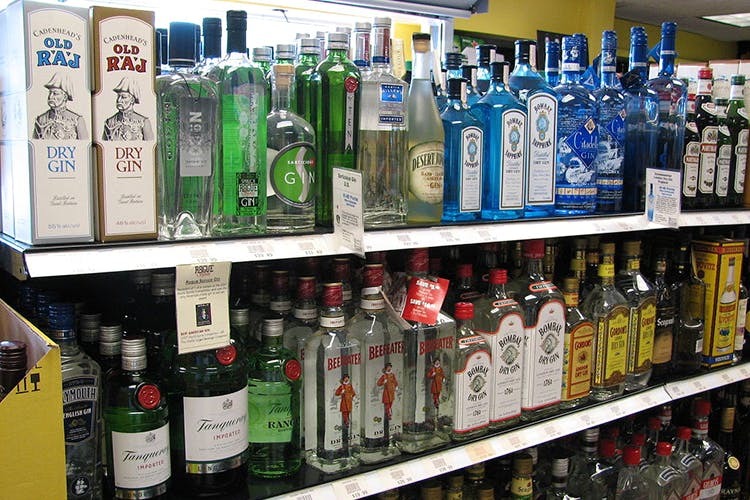 This mid-sized shop in Jangpura boasts of a rich range of imported liquor. Their wine cellar is full of wines from all over the globe, and is safely kept at a regulated temperature. If there’s a particular bottle you’re searching for, they’ll be happy to arrange it for you (provided it’s registered in Delhi) in just 48 hours! Chitranjan Suri in the Savitri Cinema (now DT) complex in GK II is always crowded, and for a good reason. Apart from the usual, they keep classics like Glenfiddich, Glenlivet and Chivas, aged between 12 to 18 years. This is also one of the few places you can get a small bottle of wine if you’re planning to go solo. Since it's inside a mall, this store is a bit fancy. They stock a bunch of luxury, liquor options but we usually head here for Desperados beer. This shop is also a great place if you're looking for liquor gifts. Do you know about the lights market in Khan Market? The same building has a wine & beer shop that has an impressive inventory of liquor. From many kinds of beer to good wine (like Carlo Rossi), this shop has it all. Located right beside Radisson Blu, this is one liquor store in Dwarka we don’t mind visiting solo, whenever the mood strikes us to chill at home with a glass of good wine. The store is of a decent size, which makes it convenient to move around and browse. If you’re looking for something other than Sula and Fratelli, you won’t be disappointed. This is a department store with a first floor dedicated to liquor and other party items Their forte, undoubtedly, is wine. They have shelves upon shelves of reds and whites from different countries (Spain, France, Chile), as well as domestic ones such as Sula and Jacob’s Creek. The fridge is full of beer. There isn’t a great variety of these, but you’ll get brands like Kingfisher, Mahou and sometimes even Stella Artois. We love their accessories, by the way (alligator-shaped bottle openers, fox-shaped flasks etc).